Baler is fast making its name as one of destinations for surfing. It is known not only for surfing but also for its heritage and history. Waterfalls, panoramic beaches & historical sites are some of the things you will see & enjoy. Join us and learn the basics of surfing! We can't wait to bring you there. ​Food: If you love eating, then going on a restaurant hopping can be a gastronomical experience in Baler. Restaurants abound Sabang Beach. Try Yellow Fin & feast on their grilled dishes like squid, chicken, pork belly and more. Tip: Bring home a bottle of coco jam & locally made peanut butter. Want to surf but do not know how to swim? No worries. Our package includes a 1:1 instructor who will not leave your side. You can surf in shallow water & still have fun. ​This is our nth time to avail your tour & we are glad that you do not fail to give us a great & wonderful experience in every place that we want to go. 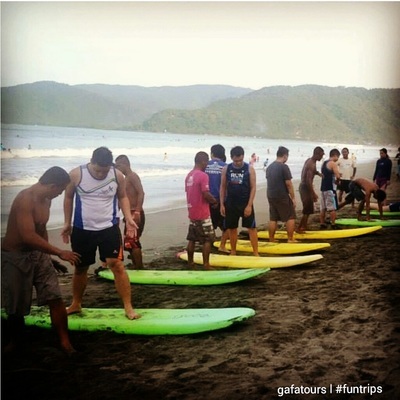 We really enjoyed our extreme adventure experience as we conquered our fear to the big waves of Baler. To kuya Benjie (favorite driver of our group) & kuya Gerald thank you so much for all the wonderful photos & also for the safe ride. God bless & more power to GAFA team. ﻿Day 1. Arrival in Baler town. After breakfast, start of Countryside & Historical Tour. Visit Largest Banyan Tree, Museo de Baler, Quezon Park for photo shoot. Head to Baler Church & see Aragon's House. Proceed to Ermita Hill. It has 136 steps to reach the top where one can see the Chapel deck & the magnificent view of the Pacific Ocean, Baler Bay, Baler town, Sabang Beach & Dimadimalangat islet. Group then treks to Ditumabo Falls. After the falls, check in and guests' own free time or prepare for Surfing lessons for guests will take this optional activity. Day 2. After breakfast, check out then proceed to Pasalubong Center. Dig in the shops' various offering of native products & delicacies. 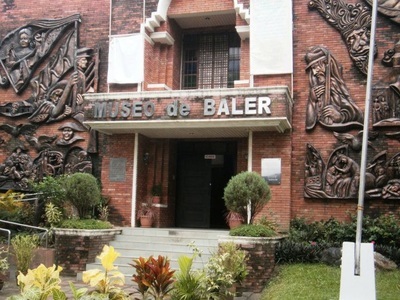 Have lunch in Baler town then travel back to Manila. ​Other hotels are subject for quotation. Please email us.